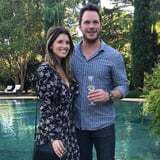 Chris Pratt and Katherine Schwarzenegger are hearing wedding bells! The couple got engaged in January after less than a year of dating, and they are slowly beginning the process of planning their wedding. While Chris and Katherine still have a lot to figure out (I mean, it's only been a month since their engagement), the 39-year-old actor did recently reveal a possible wedding date. How exciting! Chris and Katherine first went public with their romance in June 2018 after they were spotted on a romantic picnic in Santa Barbara, CA. The two have been going strong since then, and even have dad Arnold Schwarzenegger's seal of approval. "That was really fantastic. She is so happy, they both are so happy," Arnold said to People of their engagement. "As I said to him, he is such a likable guy. I love Chris - he's fantastic." Here is everything we know so far about their big day!